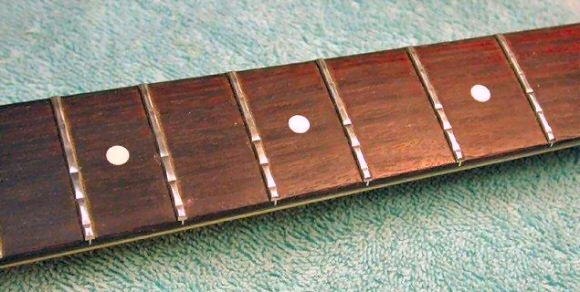 There are two levels of fret repair: fret dressing and re-fretting. If the frets are uneven (possibly from new on cheap guitars) or are slightly worn then they may only need dressing. If they are heavily worn a whole or partial re-fret may be required. With the strings removed the truss rod is adjusted so that the fingerboard is perfectly flat. The frets are then carefully filed down with a fret stone so that all wear is removed and they are perfectly level over the whole fretboard. But this leaves the frets with a flat top, so the round profile is restored using a special concave fret dressing file. The fret ends are then rounded off and the frets polished up to a high shine to give you perfect string bends. The is a limit to how often frets can be dressed. Because the frets have to be stoned down to the level of the deepest groove you can usually only dress frets once or sometimes twice before a full re-fret is needed. For that reason, when only the first four or five frets are worn I prefer to perform a partial re-fret – replacing only the worn frets before dressing the whole fingerboard in the normal way. That way only the minimum of material is removed from the fret crowns, and this procedure can usually be performed three or four times before a full re-fret is needed. Does what it says on the tin. All the frets are carefully pulled out and replace with new fret wire. If you want fingernail divots planes out of the fingerboard or the fingerboard radius chaanged, this is the time to do it. Every re-fret, full or partial, includes a full setup, so your guitar leaves the workshop as good as new, if not better.